Securing PDF files with Safeguard is very simple. Select your PDFs then the ‘Make Secure PDF’ menu option. Stop screen grabbing applications (even from remote connections), prevent use of Windows print screen. Securing PDFs with Safeguard is more secure than Adobe password protection and provides total PDF security regardless of where your PDF files reside. Safeguard PDF Security does what it says – it provides a manageable, cost effective uncomplicated way to secure PDF documents, your investment. What is PDF file security? 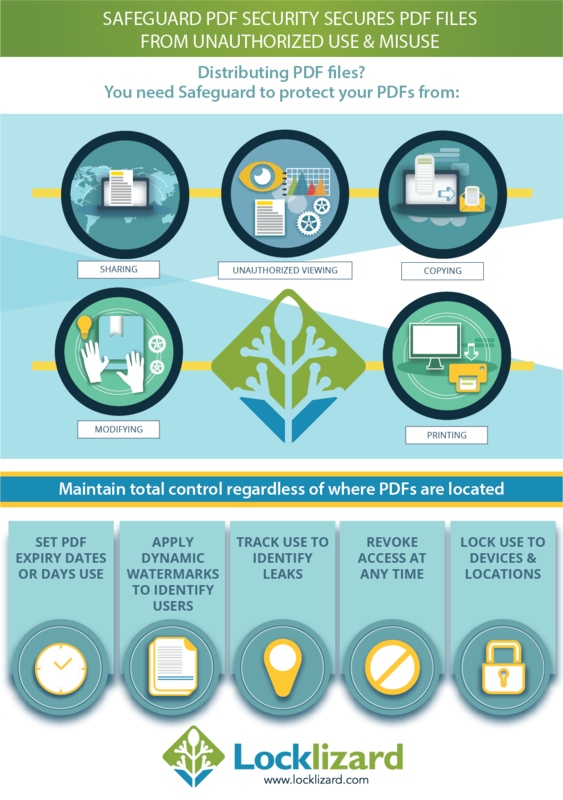 While PDF encryption is used to secure PDF documents so they can be securely sent to others, you may need to enforce other controls over the use of your documents to prevent authorized users using documents inappropriately. For example, you may want to stop users copying text or printing PDFs. So PDF file security is delivered by of a combination of different features – encryption, controls (digital rights management controls), etc. – that are relevant to the overall document controls you wish to achieve. The amount of security you achieve depends upon the effectiveness of the controls you implement. Underpinning the controls is the strength of the PDF encryption and the implementation method. If it is weak or can easily be subverted then it adds no value. Encryption is used to prevent unauthorized users from accessing your secure PDF files. PDF copy protection is implemented through the use of PDF encryption. It is almost impossible to prevent people from copying files – after all, everything on a computer has been copied in order to use it. But if a file is encrypted, even if it is copied, if the recipient does not know what the decryption key is then they cannot use the file even though they have a copy. PDF Restrictions give you limited controls over what an authorized user can do with a document. In Adobe Acrobat they are called PDF Permissions and enable you to restrict editing, printing, or copying text. There is no point in applying PDF security controls that users can readily bypass. Unlike Adobe permissions these cannot be removed. PDF digital rights management is discussed in more detail here – PDF digital rights management. To encrypt a PDF you need to use a key. The most common method is using a password as the key. However, PDF Password Protection has serious issues and is not recommended if you want to secure PDF files from unauthorized use and distribution. Public Key Technology is much more secure than password protection – the key is not exposed to the user so cannot be attacked. In addition there are no passwords to manage or for users to forget. Licensing controls allow you to establish policies, watermarks, and restrictions that are unique to each user. Licensing controls also enable you to lock PDFs to specific devices and log document use. Why would I want to secure my PDF documents? There are many reasons why you would want to secure your PDF documents using PDF file security. The main reason however is that you need protection for your PDF documents beyond what encryption provides. The most likely reason being is that you want to have some control of your PDF documents once they have been decrypted (for example whether a recipient can copy text from your document). This may be because the information is privileged for a certain group of people or you are selling information that you do not want to be distributed at your cost. So how can I secure my PDF documents? Well, at the basic level you could use a product like Adobe Acrobat. However, it is wise to bear in mind that there are tools freely available on the Internet that remove the copy controls you have applied literally within seconds. This is also true of other secure PDF products that use passwords or plugins to Adobe Acrobat. If you are serious about protecting your documents then you will probably want to purchase a PDF file security product that is not password based – read PDF password protection to see why – and uses US Government strength encryption. Download PDF file security software that uses US Government strength encryption, digital rights management controls, and does not use either passwords or plug-ins to secure your PDF documents. To learn more about PDF security, read the following white papers. Also see PDF Security Issues which covers flaws and cracks in various PDF Security implementations. There is no point in applying PDF security to secure PDF files if it can be easily bypassed or removed. PDF password protection has been the traditional way to impose PDF digital rights management controls on PDF document users, but it has a number of drawbacks. One problem in password based PDF file security is that a number of suppliers provide tools for removing the protection controls on the basis that you are the document owner and you have ‘forgotten’ how to use a document that is yours. The weaker the password the sooner it is broken. In Adobe Acrobat, a number of additional controls (PDF permissions) such as stopping printing, editing, and copying text, can be added when you secure a PDF file with a password. However, because the Adobe Security Handler design is poorly implemented – How the Adobe PDF Security Handler works – it means no matter how strong the password used to secure the PDF, the PDF restrictions can be removed in seconds. So reliance on some of the controls being provided may not be as wise at it seems – they are totally useless. Some PDF Security products use plugins to secure PDFs from unauthorized use and to control what users can do with documents. However, plug-ins may (and often do) act in conflict with each other, and other plug-ins may be used to compromise the security of the PDF security plug-in. Also, the Adobe PDF Reader was not designed to operate in a secure manner, and it is not possible, as a plug-in, to control what the application can do, so any ability to compromise the application will also compromise the security. See PDF Security Plug-ins. PDF file security is achieved when the different components work together correctly. So if some of the controls are implemented by one supplier and others by another you need to make sure that the combinations work together. Locklizard PDF Security cannot be compromised by plug-ins because we use our own Secure PDF Viewers that prevent plug-ins from being loaded. We supply and control the environment so that no vulnerabilities can be introduced. Web based PDF security systems, such as those used for secure online document sharing, may seem convenient but use passwords that can be shared with other users. Since no software is installed on the device they cannot control Operating System behaviour so users can screen grab content and print to file drivers (e.g. Adobe PDF) if printing is allowed. Safeguard PDF Security gives you complete control over your PDF files, preventing unauthorized copying, modifying, printing and distribution. Securely share or sell PDF files by controlling who can access them and enforcing how long they can be used, no matter where they reside. Protected PDFs are locked to authorized devices so they cannot be shared with other users and PDF files are decrypted in memory so there are no unprotected files that users can distribute. Safeguard Enterprise is a PDF security solution for the larger organization. Users view protected PDF files using our FREE secure PDF viewers. These can be installed on a device, or users can view secure documents in their browser or from a USB stick with our zero installation solutions. Why Locklizard for PDF Security?